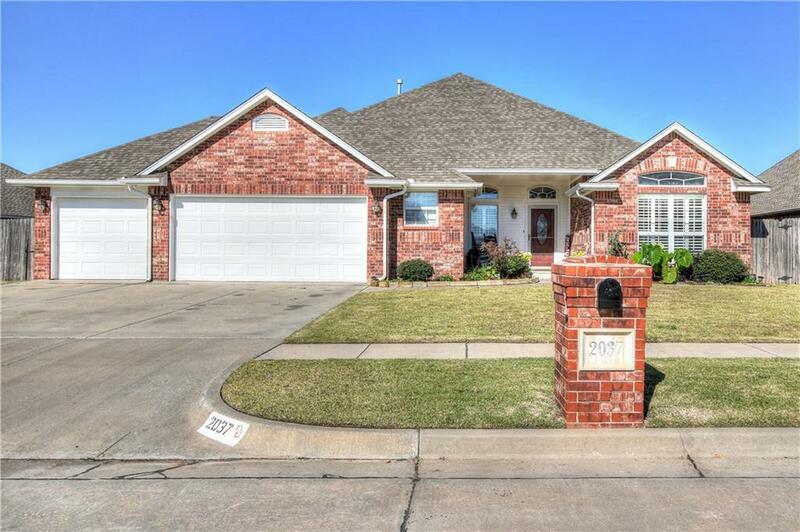 Well kept home in popular Oak Ridge community! Spacious living room with crown mold, new granite counters & granite breakfast bar with tumbled marble back splash, overlooking the living area. Separate study that could be used as a 4th bedroom w/closet & double bookcase, wood floor. The formal dining area could be used as the office/study or a 5th bedroom. Large kitchen w/pantry, window seat, eat in area with a formal dining room right off the kitchen. Lots of storage throughout home. Master bedroom has large bath with whirlpool tub and a tiled walk-in shower with a walk in closet and TONS of storage! Garage has 2 work shop/storage areas. Full sprinkler, storm shelter, storage bldg approx. 8 x 12ft. Enjoy a relaxing evening on your large covered patio! Schedule your showing today.